Do you know any great Canadians? If you do you can nominate them and send them a coupon for a Free product! 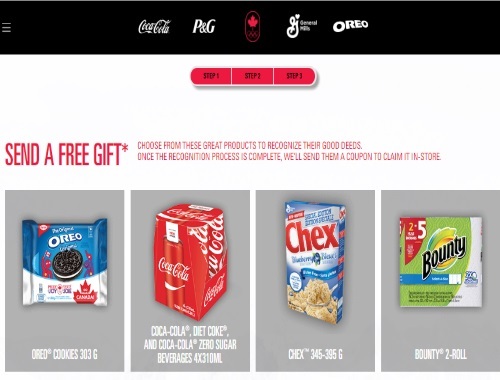 Free product coupons include Free Oreo cookies, Free Chex cereal, Free Coca Cola 4 packs or Free Bounty! Coupons will be accepted and redeemable only at participating Atlantic Superstores; Loblaws; Provigo; Valu-mart; Your Independent Grocer; Zehrs and Dominon stores. Nominees can be nominated once during the program period. The 10,000 Free product coupons are available and offered to the Nominee only and while supplies last. Nominees are sent an email after being nominated and must complete the online request form to receive a coupon. Link for the coupon which is found within the email expires March 23, 2018. Coupons are redeemable until April 15, 2018 only at the defined Canadian retailers on website and within the Terms. Each coupon is redeemable for one of four participating products as defined on the coupon. There are only 10,000 Free coupons available! Offer is while quantities last, or until February 28, 2018.